We are very aware of the paradox of operating a small company in a relatively unknown tourism destination: "Kie...you...cut? where's that and how do you get there?!" The magic of our remote wilderness setting is directly linked with the lack of people, traffic, noise, and "built spaces". Meanwhile, we need to promote this, making ourselves and this place more known, to fill our season with guests who seek and benefit from experiencing and re-connecting in an incredible wilderness location! Kyuquot's people, businesses, and location aren't poised or interested in mass tourism - it's not the 'nature' of the people or place. This positions us in the "boutique" category of tourism, a very distant cousin and the antithesis of more "mass" tourism experiences. From our enchanted wilderness retreat on Spring Island, yes, there's plenty of evidence of human impacts on the landscape, opportunity to interact with some of the 200 or so local residents, and the early morning hum from a few sportfishing boats buzzing around in July and August. For the most part though, "nature" is repairing, reclaiming, and re-balancing after decades of resource and species extraction and damage that was the local story here and elsewhere for most of the 20th century. And, ("heaven forbid" or "thank goodness") your cell phone and wireless devices won't receive a signal on Spring Island (unless you care to invest in satellite technology!). This feature alone might make it "The Perfect Island" and possibly the new definition of "wilderness" in the 21st century - 'beyond the reach of cell and wireless'?! 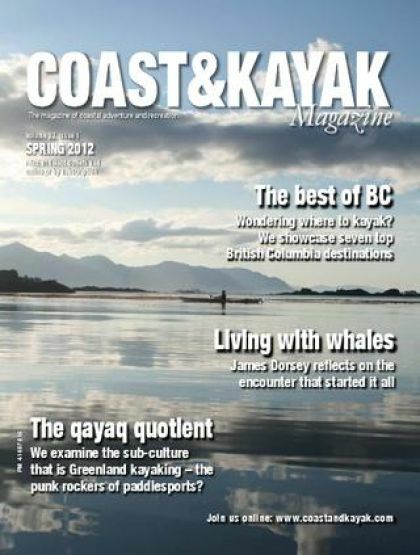 One of the more "productive", well-paddled, and technologically savvy kayakers that I know is John Kimantas, publisher of Coast & Kayak Magazine, The Wild Coast guide book series for British Columbia, and the BC Coastal Recreation Atlas. He loves to really get away though, and to our delight featured our location as The Perfect Island in his Best of BC issue of Coast & Kayak Magazine, Spring 2012. This proclamation was no surprise to us - we've operated there for 40 years for very real reasons! 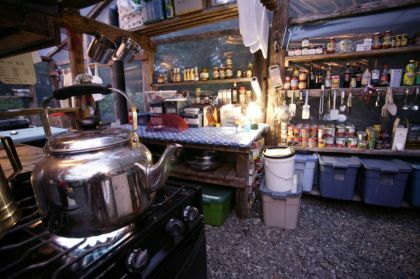 Together with our with our wonderful guides, staff, community and industry partners, cultural interactions, wildlife opportunities, gourmet meals, luxury camping comforts, and, well, 'peace and quiet', we have a winning recipe!! Now, back to threading the paradox of telling people this while maintaining a wilderness experience... Fortunately, we only have space for about 150 or so guests each summer, about 10 at a time - hardly a flood, and completely in synch with our island infrastructure and the community / wilderness flavour and rhythms that keep Kyuquot and West Coast Expeditions distinct.